The white rhino is largest of the five living species of rhino, and in contrast to the black rhino, has a hump on the back of its neck and a distinctive square lip (white has nothing to do with their colour, and is thought to be a misinterpretation of the Dutch “wijd”, meaning wide). 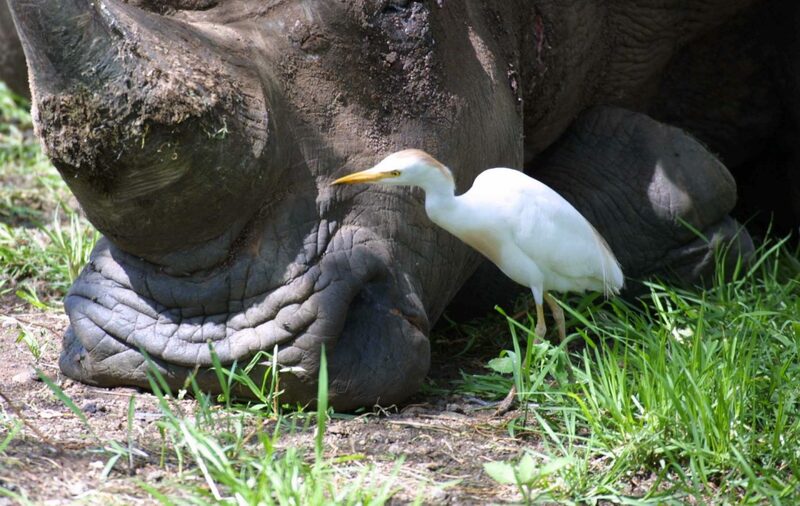 White rhinos live in herds – or crashes – of up to 15, mostly female, individuals. Most adult bulls are solitary. There are two subspecies: the southern white rhino and the northern white rhino, which is almost certainly extinct in the wild. 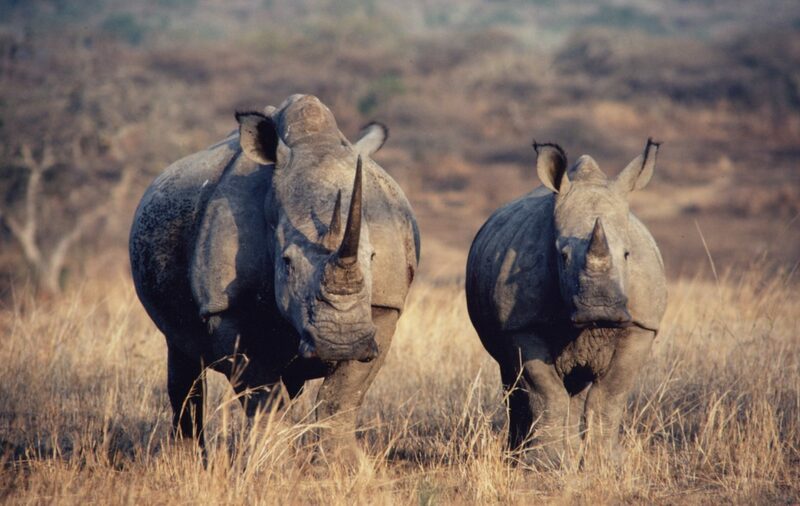 There is an estimated 20,000 southern white rhino in southern Africa, with the vast majority (> 90%) in South Africa. 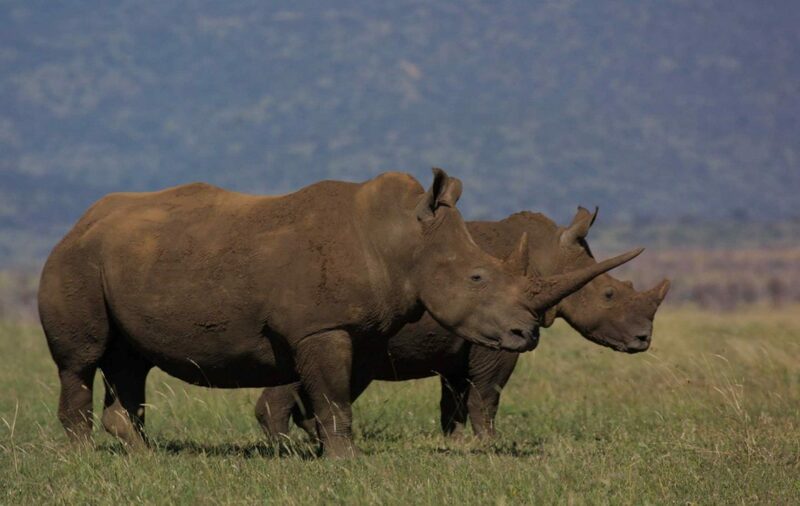 Only three northern white rhino are thought to remain, all at Kenya’s Ol Pejeta Conservancy. 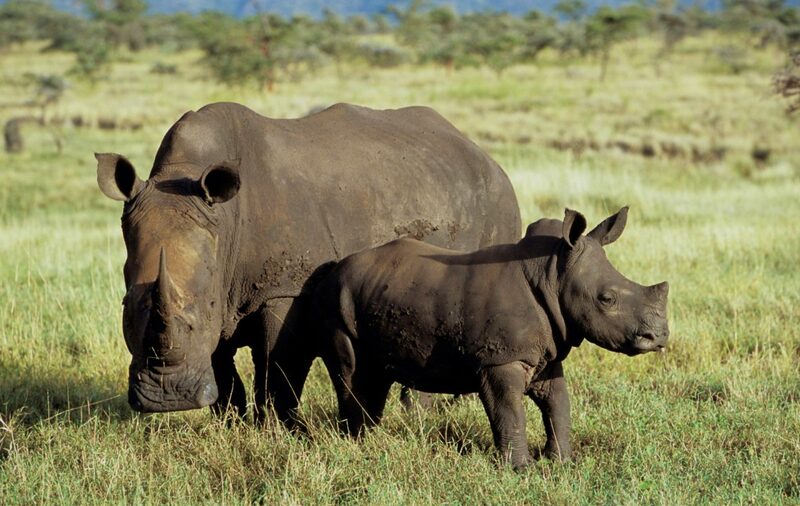 Southern white rhinos are found in then grasslands of South Africa, Namibia, Botswana, Swaziland and Zimbabwe. They have also been introduced outside their historical range to Kenya, Uganda and Zambia. Northern White Rhino used to be found in the border region of DR Congo, Uganda, Chad, Sudan, and Central African Republic. White rhinos are grazers, using their broad, straight lips to eat grass. White rhinos are threatened by poaching for their horns, which were once a prized material for dagger handles in the Middle East, but are these days destined for Asia where they are ground into a fine powder and used as alternative medicine to treat a variety of illnesses, especially fevers. Poaching in South Africa has escalated from 13 killed in 2007 to more than 1,000 per year since 2013. At the beginning of the 20th Century there were as few as 20-50 southern white rhino in one area of South Africa, and their recovery was a big conservation success story. Their protection today requires high levels of security to prevent poaching. Tusk supports anti-poaching efforts in South Africa, Zimbabwe and Kenya.